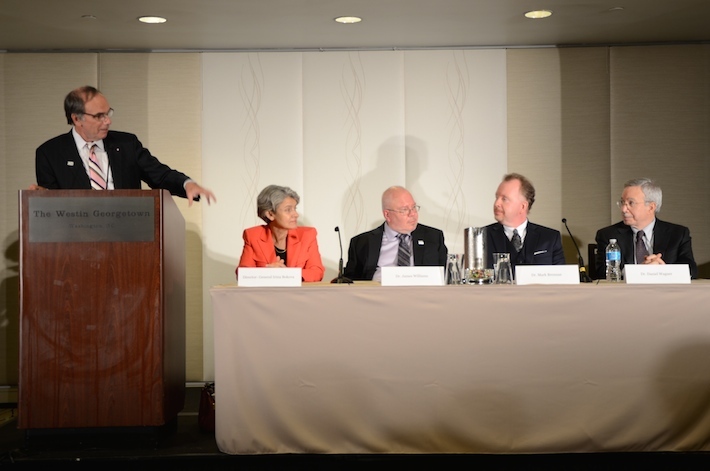 GW’s UNESCO chair in international education for development plans to build citizen-leaders. About 120 million youth around the world lack access to education, according to UNESCO, the United Nations scientific and cultural organization. Irina Bokova, director general of UNESCO, says the George Washington University is poised to help decrease those numbers. “The George Washington University embodies what I see as the core mission of education in the 21st century—to promote cutting-edge learning for the benefit of all,” Ms. Bokova said during a keynote address to an audience of students, faculty, staff and UNESCO representatives on Friday evening. “We need a new push in education,” she said. GW’s Graduate School of Education and Human Development hosted Ms. Bokova and U.S. Ambassador to UNESCO Crystal Nix-Hines at the Westin Hotel Georgetown to celebrate the installation of the university’s UNESCO chair in international education for development. The appointment places GW among a consortium of 760 UNESCO chairs and 812 institutions in 128 countries that have been working to build peace, combat illiteracy and empower communities in conflict through research, mentorship and community programs since 1992. 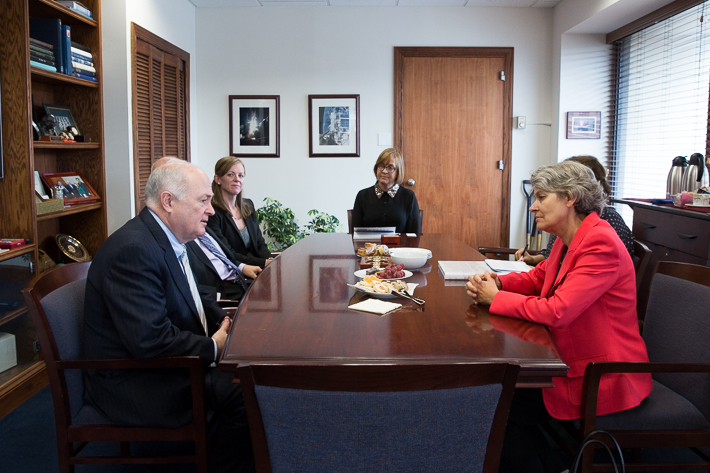 UNESCO Director-General Irina Bokova met with George Washington President Steven Knapp on Friday afternoon. Dr. Knapp gifted Ms. Bokova a selection from the Eleanor Roosevelt Papers Project, held by GW. Provost and Executive Vice President for Academic Affairs Steven Lerman, J.B. and Maurice C. Shapiro Professor of International Affairs Esther Brimmer and GSEHD Dean Michael Feuer also participated in the program. Former GSEHD dean and professor Mary Futrell also attended. UNESCO’s activities range from defending journalistic freedom through World Press Freedom Day to preserving the cultural property of countries in conflict, such as Iraq. Unlike most UNESCO chairs, GW applied for the chairmanship through GSEHD’s International Education program rather than through a single faculty member to encourage collaboration among faculty members and other scholars. GW’s International Education Program Director James H. Williams will serve as chairman with two co-chairs— Laura C. Engel, assistant professor of international education and international affairs, and Bernard T. Streitwieser, assistant professor of international education. "Since wars begin in the minds of men, it is in the minds of men that peace must be constructed,"GW UNESCO Chair James Williams said quoting the UNESCO constitution preamble during the panel discussion. During the 2015-2016 academic year, the trio will work under the theme “Education, Identity and the Civic Good.” They will collaborate on research, a speaker series and other programming centered on three priorities: social inclusion, education building and teaching global citizenship in the 21st century. An internship program, which will send students to work in UNESCO offices globally, is also in development, Dr. Williams said. Dr. Feuer moderated a panel discussion with Dr. Williams, Ms. Bokova and Mark Brennan, the Pennsylvania State University UNESCO chair for rural community, leadership and youth development and Dan Wagner, the University of Pennsylvania UNESCO chair in learning and literacy, explored the direction of global citizenship. U.S. 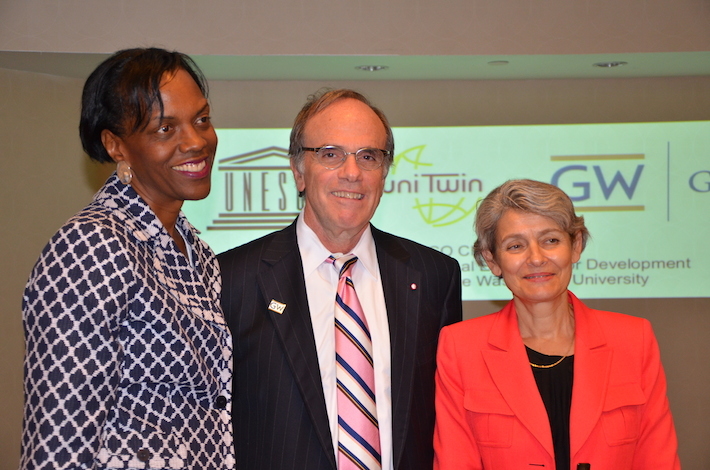 Ambassador to UNESCO Crystal Nix-Hines, Graduate School of Education and Human Development Dean Michael Feuer and UNESCO Director General Irina Bokova celebrated the installation of GW’s UNESCO chair in international education for development. Ms. Bokova said that empowering youth to be global citizens is integral to achieving the United Nations Millennium Development Goals for 2015— a set of eight milestones that include decreasing HIV deaths on a global scale and improving primary school education. Despite progress toward ensuring that the quality of learning is improved worldwide, there is still much work to be done, Ms. Bokova said. There are currently 780 million adults worldwide who cannot read. Dr. Feuer added that as UNESCO and the GW chairs continue their work, it is important to remember the bottom line—education is a public good.